Staffordshire Bull Terriers, or Staffies as they are affectionately known, are a hardy breed and are affectionate and loyal to their owners. Staffordshire Bull Terriers are misguidedly seen as good guard dogs when they are in fact, a very people friendly breed and excellent as a family pet, preferring your lap or the sofa to being on their own. As they are a very strong, sometimes boisterous breed it is vital to provide good basic training to keep them calm around visitors and enable you to enjoy your walks on the lead. 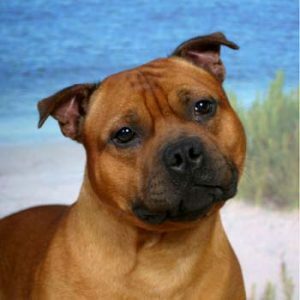 A fearless character with a muscular appearance, the Staffie is eager to please and enjoys companionship. Staffordshire Bull Terriers have little sense of fear or cautiousness and are therefore likely to get themselves into situations where they could be injured. Even though the Staffordshire Bull Terrier has received bad press in recent years, with careful training and socialisation they make wonderful pets and will give many years of loyal service to their owners. 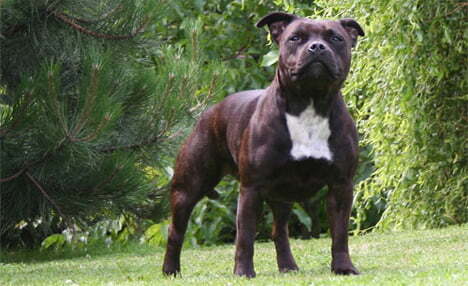 Staffordshire Bull Terriers can be brindle, black, fawn, red or blue. Any of these colours, along with white, are acceptable. Staffordshire Bull Terriers have a smooth, short haired coat needing minimal grooming. A daily brush with a firm bristle brush will maintain their coat and minimise shedding, along with a bath when necessary. Their nails may require attention if they are not exercised on hard surfaces. Staffordshire Bull Terriers are a very healthy breed with a strong constitution. They can be affected by some common ailments, such as cataracts and hip dysplasia, but health screening in the parents will avoid this. Staffordshire Bull Terriers are a very strong, sturdy breed and aside from some of the more common ailments, make very healthy pets. As a Staffordshire Bull Terrier has extremely strong jaws it is wise to provide strong and durable dog toys and chews as it will be very easy for your dog to chew a weak plastic toy and choke on any loose parts. 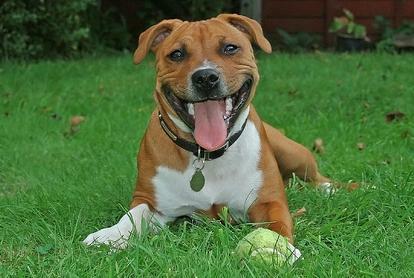 Staffies are a loyal family member who prefer the company of their family to being alone. Contradictory to the bad press the Staffordshire Bull Terrier receives, they are exceptionally good with children, although as with all breeds of dog they should be supervised at all times. They are very friendly towards people and are likely to be excitable and boisterous around people they meet. Staffordshire Bull Terriers can sometimes be intolerant towards other dogs and animals, so care should be taken with other animals in the home. Caution should be taken with a Staffordshire Bull Terrier as they are a naturally fearless dog and will happily jump from great heights or run into a road without fear or caution, thus causing themselves injury. Staffordshire Bull Terriers will not back away from a dog that is being aggressive and therefore care should be taken with any unfamiliar dogs that approach off the lead in order to prevent a fight, as with many breeds of dog. Firm handling and teaching good socialisation skills from a young age is advisable, as with all powerful breeds. As Staffordshire Bull Terriers are a strong dog, teaching the basic commands, as well as lead training, is imperative to avoid the dog becoming out of control and pulling on walks. Staffordshire Bull Terriers are very intelligent and quick to learn but can be stubborn at times, although food as a reward will help as the Staffordshire Bull Terrier has a very good appetite. 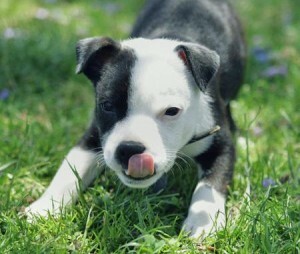 As a high energy dog a Staffordshire Bull Terrier requires plenty of exercise, at least an hour each day. Staffies also enjoy companionship and should not be left alone for long periods of time. Bred in Staffordshire, England in the nineteenth century, the Staffordshire Bull Terrier was created by crossing a Bulldog with a local Terrier to be used for bull baiting, a popular sport in those times. The dogs were also used in the marketplace to attack bulls brought to market, which was believed to tenderise the meat. Many dogs were also used for dog fighting, another highly popular form of entertainment for people of all classes. The sport of animal fighting was eventually made illegal in 1835, although illegal dog fights still took place, especially in poorer working class areas. It was easier to arrange dog fights in places where the illegal proceedings would not be traced and there was plenty of money and pride at stake with the dog fights held. The dogs were the only losers in these fights, as a dog that lost a fight was either banished by his owner for being unworthy, or died in the fight. Even though the Staffordshire Bull Terrier was bred for aggressiveness in dog fighting, it was also necessary for the dog to be handled by their owners and judges so they had to be friendly and tolerant towards people. In May 1935 the Staffordshire Bull Terrier was recognised by The Kennel Club, but the Staffordshire Bull Terrier Club was not formed until June of that year. The club was originated by a group of Staffordshire Bull Terrier enthusiasts from Cradley Heath in the West Midlands who decided upon the breed standard, as well as electing the first secretary, Joseph Dunn who was one of the founders of the club. The first event was the Cradley Club show in August 1935. Crufts was closely followed in 1936, with Best of Breed being won by Cross Guns Johnson. Since then there have been many Staffordshire Bull Terrier clubs set up around England to appreciate this noble breed. Fantastic article, describes my Staff (and every one I’ve ever known) perfectly. Very loyal, very affectionate, wouldn’t think twice about jumping off a building into the path of a juggernaut if he thought he saw a football.. Excellent , it’s like reading about my own dogs would agree with all of that i just wish more people would see the beauty of these animals as all staffie owners do and not disregard them as dangerous dogs it’s a real shame . i myself have kept staffies for years and can honestly say i would’nt ever think of having any other breed of dog . blue is a reconized colour ya dope there just the rarest, y ja think blue staffs are worth over a 1000euro and yad get any of the other colours for around 300 . now do you honestly think people are gonna be payin 1000s a euro for a mungrel ?? dont think so pal. dont comment on staffs if ya havent a clue about them. (reply to clair’s comment on march 7). i have 3 staffs myself (1 blue) and they really r d most easy to train dog. very obidient. very loyal. just one problem “they fart” Alot! !